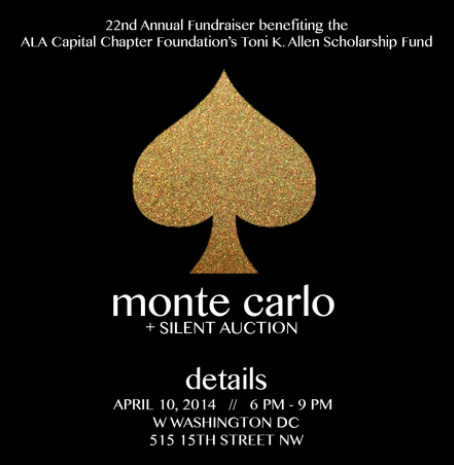 The 22nd Annual Fundraiser for the ALA Capital Chapter was held on Wednesday, April 10, 2014, to benefit the Toni K. Allen Scholarship Fund. A red carpet led into the W Hotel's Great Room through an elegantly draped archway, emphasizing the Monte Carlo Night theme. The red carpet experience was further enhanced by award-winning photographer Paco Alacid snapping away as guests entered. As guests arrived, they were given name tags and chips in the amount of $1,000 to start gambling. The gaming tables were always full of gamblers trying their luck at Black Jack, Poker, and Roulette. Energy was high as guests mingled, tasting the French inspired food and viewing over 25 silent auction items. Silent auction items included dinners at local restaurants, sports tickets, gift baskets, limousine services, handyman services, jewelry, a golf package and weekend hotel getaways. At the end of the night, guests exchanged chips for raffle tickets and anxiously waited to hear if they were prize winners. Raffle prizes included Gift cards to local restaurants and spas. Monte Carlo Night was fun and action-packed. No one wanted the night to end. The food was delicious, the gambling was fun, and people had a wonderful time raising money to provide a college scholarship to a deserving DC Public Schools senior. Thanks to all our event sponsors! Thank you, Silent Auction Donors!